This is the model of doctor's desk, to quickly set up a clinic or hospital environment. 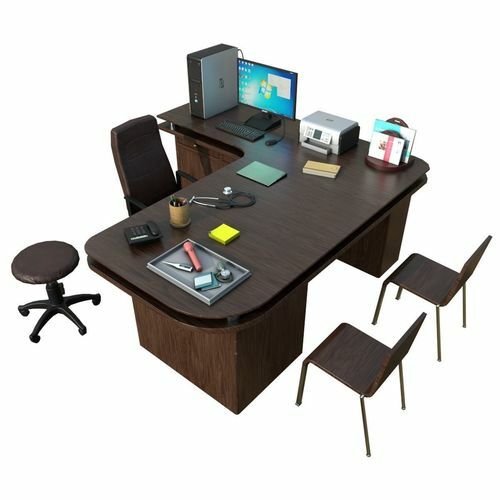 Model comes with a desk, 3 types of chairs, a desktop computer and other accessories like telephone, stationary, stethoscope, notebook, magazine, torch, thermometer, etc. The model has a clean topology and a premium look to enhance detail and add realism to any scene or project. It is low-poly and perfectly suitable for use in games and environments. The model was created in Maya 2014 and is also available in max, fbx and obj formats for importing into any software or game engine. UVs are fully unwrapped and non overlapping. The textures have been created inside Substance Painter and support PBR rendering. There are five types of textures - Diffuse, Occlusion, Normal, Metallic and Roughness. Unit is set to centimeter (cm). Real-world scale.